Tutorial: Fabric Backed Yarn Eater Blanket! – Everything Your Mama Made & More! Tutorial: Fabric Backed Yarn Eater Blanket! I have to say Pinterest is a very inspiring & useful tool for the creative mind… it is also like crack & very addictive! While I have thousands of pins on my boards I have been trying to make at least 1 project a month off of them. This project was actually completed in a few steps over a month while I was sick with strep, but it is done & well loved! My inspiration was some fabric backed baby blankets I had seen on there. I love crocheted blankets… they are soft, cuddly & who doesn’t enjoy wrapping their fingers in them? The one downside is if they have a lot of holes they can be drafty… this fixes that AND is super cute as well. You can also us this fabric backing method on a already finished crochet or knit blanket that you have laying around! I will say this is NOT meant for babies! The yarn eater blanket is heavy… a great option as a sensory or weighted blanket but I would NOT let a child under 2 sleep with one because of the increased risk of SIDS. That being said it is a great stroller & car seat blanket or lap blanket for adults. You can make them bigger you will just need more yarn & wider fabric. Warning this is the first time I have written out a crochet pattern & honestly I don’t use them often, so I hope this makes sense! It’s really simple & I think you will get the idea. Sorry for the few & not so great pictures, I have been sick & I wasn’t paying attention until I had already skipped steps. 9 6oz Skeins of Worsted Weight (4) Yarn. I LOVE Caron Simply Soft… it is affordable, soft & durable. You can do all one color or up to 3 colors. ROW 1: Using 3 strands of yarn at once (see picture above) ch 77. In the 3rd ch from the end hdc… 1 hdc in all remaining ch. (75hdc) ch 2 & turn. ROW 2-58: hdc in each hdc all the way across (75hdc) ch 2, turn & repeat. EDGING: sc around all 4 edges of the blanket to create a nice finished edge. TO FINISH Tie off ends & weave in tails! You may do more or less rows depending on how big you want it! I call it the yarn eater because with the big hook & 3 strands at once it goes quickly for it’s size but it goes through a LOT of yarn. As written I went through 6 full skeins of yarn & about 1/3 of the last 3 skeins. If you want to use more then one color you can use 2 or 3 different colors at once, just make sure you have enough in the sets of 3. This blanket alone is nice, simple & comfy! Carefully with out stretching it lay out you yarn eater blanket over the fabric you choose. Cute the fabric about 1/4″ bigger then the blanket all around. Now lay your blanket down on a big flat surface… then lay the fabric down on top with the WRONG SIDE facing the blanket. This next part is a little tricky but pretty easy if you take it slow. 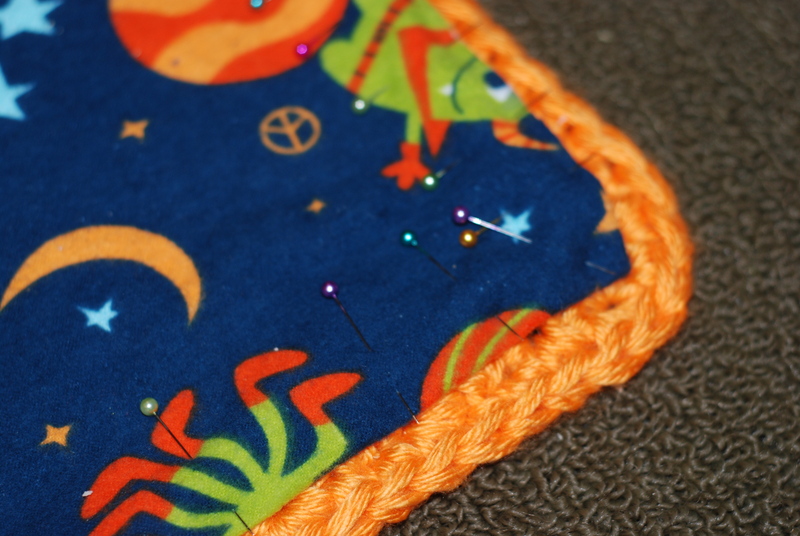 Working your way around the blanket carefully fold the fabric edge UNDER about 1 1/4″ and pin down. This will leave you with a nice finished edge & about 1″ of the crochet blanket showing on the front :). Don’t be afraid to use LOTS Of pins it will make sewing it later easier. Try not to stretch the crochet blanket under neath as it can cause it to look a bit wonky later. Stand up or step back frequently to make sure your folded under edge is even and straight. You can try using a ruler but I prefer to eye it. Time to sew it down! 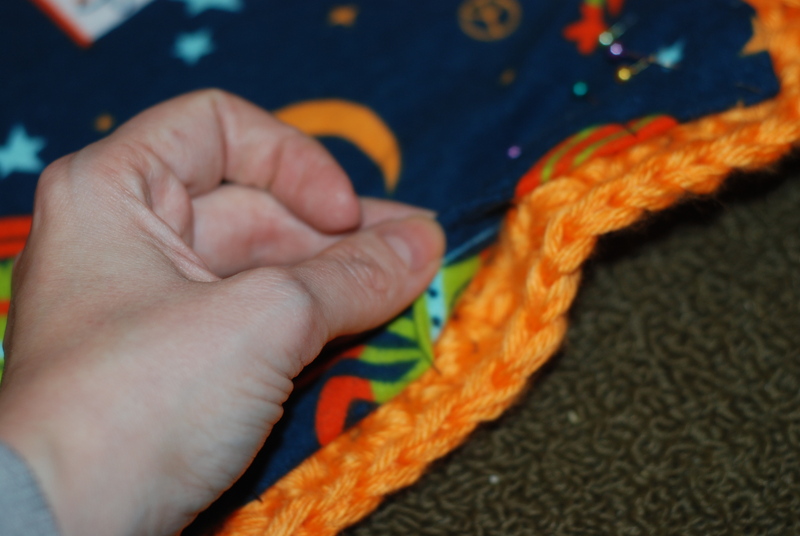 Using thread colors in the bottom to match the crochet blanket & top thread to match the fabric sew 1/8″ or 1/4″ (I refer 1/8″ but that may be harder for some machines) from the folded edge of the fabric sew the fabric down on all 4 sides. This blanket is thick & not easy to maneuver so I recommend going slow. Trim your threads & you are DONE! i am going to make a blanket for my new baby granddaughter !! great idea !! thanks ! I just used a double crochet I think with a single crochet around the edge once it was the size I wanted, but you can use just about any stitch/pattern. and the (SC) stands for single crochet. Thank you for the how to on this blanket. I make these afghans with the P hook and a single crochet thru-out but only two pieces of yarn so it is heavy but not overly weighted down. And a reverse sc or crab stitch works if you are in the mood for it. I sure appreciate your sharing this idea. What are the measurements of the finished product? Thanks for the info! I love this idea!!! I’d like to do one for my son who is 8. My finished blanket turned out about 40″x52″? It is wide enough to sit on his twin bed without going over the edges. If you need it wider just chain more until it is as wide as you would like it and same as with the length. Thank you for this tutorial. I have been looking for a simple explanation of how to attach fabric to a blanket, and this post does just that! This is brilliant. I reckon it would be soothing for adults too. May I reblog on http://www.joyfuljumblies.wordpress.com ? Thank you for the post. Did you hand sew or use a machine ? I used my sewing machine, but it could be hand sewn! Just wondering about sewing stitch you used on machine to do this. 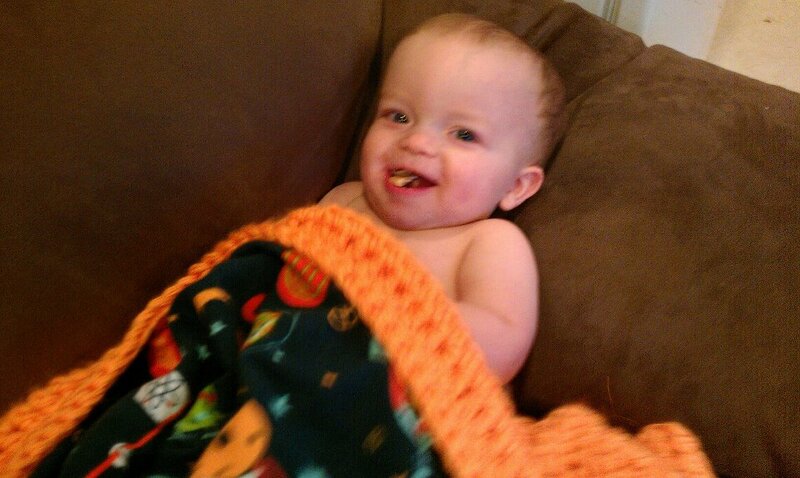 As I have a beautiful crocheted blanket I would like to line with NFL fleece fabric on the back for my 7 mo. old son. 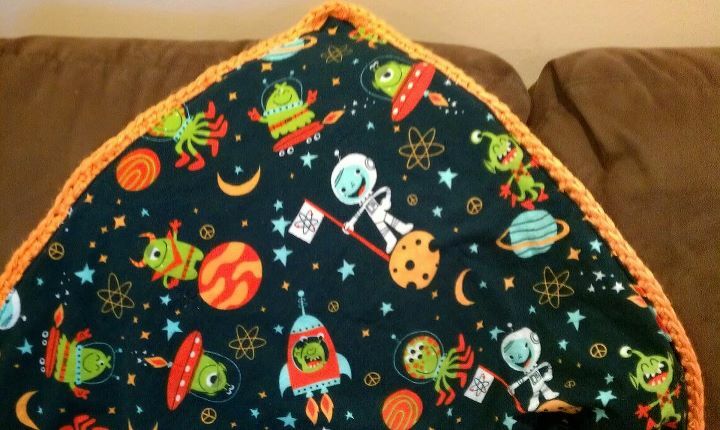 I have been searching every where for instructions like yours, I just want to make sure I have the right fabric and tension, I was thinking about using my walking foot, but would this be wise with a crocheted blanket? Any info would be much appreciated. I used just a slightly longer regular stitch. Not sure if I would use a walking foot on it, but you can always loosen the pressure on your presser foot slightly (see your machine manual). Of needle you have in your pattern before I bought it. I am using an ‘I” size hook with it. I would prefer to not go back to the store to get this yarn but I will if needed. Thanks. It’s for the thickness and weight. It will work with what every yarn, it will just weight a little different. If you get really bulky yarn you can get away with 2 strands instead.